Until now, in the last eight pAsurams, AzhwAr has said that he does not have any virtue in him and that he has all the vices too and that he does not bode well for emperumAn. He emphasises the same in this pAsuram too. emperumAn, on hearing his statement in the previous pAsuram that he, despite being a fool, had come to emperumAn, asks him “if this statement of yours (of being an ignorant, foolish person) came from your heart, I shall take this as accepting your state of being without anything in your hands and try to redeem you. Was the statement that you are a fool said by you sincerely?” to which AzhwAr responds, “even that is a lie”. emperumAn asks “If there is nothing in you as a means to attain me, how do I redeem you” and AzhwAr says “is there any means other than the connection with your divine feet and your causeless mercy?”, mentioning the ultimate means for attaining emperumAn. Let us enjoy the pAsuram and its meanings, first. 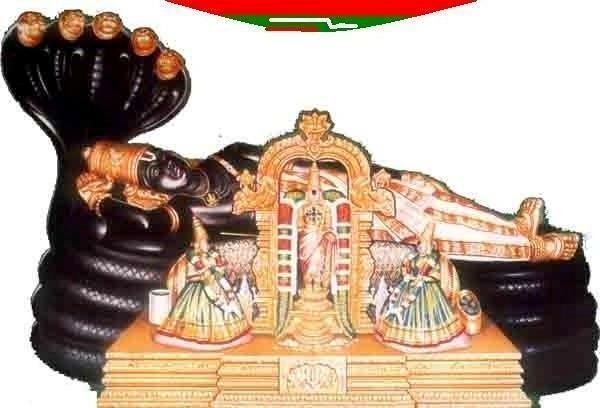 aranganE – the dweller of thiruvarangam (SrIrangam)! vandhu ninREn – I stood in front you, the omniscient. meyyellAm – mey (truth) is something which leads to good for all jIvAthmAs, and describes things as they are [without adding or removing anything]. Truth is the basis on which AzhwAr had said in the earlier pAsurams the good things that he did not have. In kaiSika mahAthmyam 32 nampAduvAn says “sathyamUlamitham sarvam lOka:sathyE prathishtitha: I nAham mithyA pravakshyAmi sathyamEva vadhAmyaham II” (it was through sathyam (truth) that all these worlds came about; the world sustains on truth; (hence) I will not speak lie; (always) I will speak the truth). Because he had a bit of involvement with emperumAn, nampAduvAn, despite being born in a lowly caste and carrying out the deeds of that caste, told the brahmarAkshas (a demon) that came to eat him “those who are involved with emperumAn will not tell lies”. ellAm – since truth is of different types, AzhwAr says all types. In other words, thinking of something, as it is, speaking it, as it is, and doing it, as it is. The opinion here is that he does not have any of these truths in him. Alternatively, some people will speak truth to their relatives and lies to others; he implies that he does not speak truth even to his relatives. pOgavittu – I got rid of these truths to such an extent that they did not even find a place in the country that I live in. If I speak truth to my relatives, a trace of that would be with me; I did not do even this. Since samsAris are ignorant, it is possible to speak lies to them and manage; but I spoke lies even to you, who is omniscient, laments the AzhwAr. When emperumAn asks him as to where he learnt to speak such lies . . . .
viri kuzhalAril pattu – I moved with women, says AzhwAr. The meaning implied here is that just as it is impossible for someone to speak lies when he is close to emperumAn, it is impossible to speak truth when someone is with women. Is it not rare for someone who speaks truth to be in the company of women? virikuzhalAril – if the lady had done up her hair, the man would exclaim “how beautiful it is! How well the garland has been strung around the hair!” And, if the lady had let loose her hair, he would exclaim “what can I say about the beauty of the hair let loose, like a peacock spreads its wings!” Just as nammAzhwAr says in thiruvAimozhi 5.10.2 “adhu idhu udhu ennalAvana alla ennai un seygai naivikkum” (if one thinks of the playful activities of emperumAn he would be totally involved and lose himself in emperumAn), the person engages with women in the same way that a sAthvika (purely good) person engages with emperumAn. pattu – just as a fish trapped by a net cannot extricate itself, a person who gets trapped by women also cannot extricate himself. The extent to which he is trapped can be gauged from the fact that even when AchAryan (teacher) shows him the beauty of emperumAn’s thirumEni through his upadhESam (spiritual teaching), the disciple’s heart keeps thinking of the women who are sweet to him. poyyellAm podhindhukoNda – just as he got rid of all the truths, he accumulated gradually, all the lies. AzhwAr shows that just as involvement with emperumAn would make liars to speak truth, involvement with women will make those who speak truth, to speak lies. ellAm – just as truths are of different kinds, lies are also of many types and hence he uses the word ellAm (all). He has accumulated whatever goes by the name of “lie”. podhindhu koNda – AzhwAr says that he made sure that none of the lies that he accumulated, left him. He says that he is the wholesale merchant for lies so that if someone wants to tell a lie to his lady, he would approach AzhwAr. He made sure that none of the lies escaped from his clutches. pOtkanEn vandhu ninREn – if I think of my lowliness, I would step back saying “only those who speak truth can approach emperumAn. A liar like me should not approach him”. Since I had no other place to go to, rather shamelessly, I came and stood in front of your divine presence. ninREn – just as those who carried out certain tasks as means to attain emperumAn [such as karma yOgam, gyAna yOgam, bhakthi yOgam] stand at the doorstep of emperumAn to collect their benefit, like a servant stands for his salary, I too stood like them. pOtkanEn – one without a refuge. emperumAn asks him “I am approached by those good people who are able to control both their external and internal sensory organs. Why are you coming to me? Why don’t you go to those women with spread locks?” . . . .
aiyanE – Since I have a natural relationship with you which cannot be severed, I came. Even children, who have caused harms to their parents, approach them through the backdoor. I have such a relationship with you. aranganE – emperumAn asks him “was it through SAsthras (sacred texts) or through AchAryan’s upadhESam (teaching of a guru) that you came to know of this relationship?” AzhwAr responds “it was not through these, but because you came to thiruvarangam to take rest, that I came to know” How is this possible? emperurAn, not considering the superiority of SrIvaikuNtam, came down to samsAram, knowing very well that it is inhabited by those who hate him, only to ensure that samsAris are redeemed. That the samsAris are people who are not detested by him is clear from the way he is lying at SrIrangam after taking a vow that he will not leave this samsAram until it is fully uprooted [and shifted to SrIvaikuNtam]. emperumAn asks AzhwAr “what is it that you want from me?” . . . .
un aruL ennum Asai thannAl – vandhu ninREn – My desire is that I should get your grace; hence I came. His grace is such that even those who have harmed themselves to such an extent that they will get ruined, can desire for it. In SrI rAmAyaNam yudhdha kANdam 38.95, vAlmIki says “satham nipathitham bhUmau saraNya: saraNAgatham I vadhArhamapi kAkuthsa: krupyA paryapAlayath II” (even though kAkAsuran, who fell to the ground and surrendered, deserved to be killed, SrI rAma, through his grace, saved him, as he is the refuge). emperumAn says “I am waiting for persons like you who do not have anything good in them and who have all the vices in them and who know the relationship between themselves and me. Isn’t it true that you have come after realising this?” . . . .
poyyanEn – AzhwAr responds “if I look at it deeply, even this appears to be false. Can there be anything that I can claim as truth in front of you, who is omniscient?”. poyyanEn – there is nothing that I do not have which is called as vice. I said this because, ahirbhudhnya samhithai 37.30 says “ahamasmyaparAdhAnAmAlayO’kinchanO’gathi: I thvamEvOpAyabhUthO mEbhavEthi prArthanAmathi: II SaraNAgathirithyukthA sA dhEvE’smin prayujyathAm II” (“I am repository of all vices; I do not have any means (to protect myself); I do not have a refuge (other than you); you have to be my means” – SaraNAgathi is the thought that prays like this. Let this be carried out in the matter of this bhagavAn). SAsthras say that if one says like this in your divine presence, it will yield benefit. Hence I said that, says AzhwAr. I did not say it because my lowliness hit me. poyannEnE – I said this lie to you, who is omniscient by nature, such that even you were deluded into believing as truth what I said as lie. Thinking of the lies that he had said in the earlier pAsurams such as “Adharam peruga vaiththa azhagan” (16), “kaNNiNai kaLikkumARE” (17), “paniyarumbu udhirumAlO” (18), “udal enakku urugumAlO” (19), AzhwAr says “poyyanEn poyyanEnE” . How many lies can I say in your divine presence, where I should be speaking only truth? Let us move on to pAsuram 34, next. This entry was posted in mudhalAyiram, thirumAlai on November 16, 2016 by T N Krishnan.